NBA Game Basketball | Sports Memorabilia! NBA Official Full Size Game Leather Basketball by Spalding. Current ball includes "@NBA" on it. 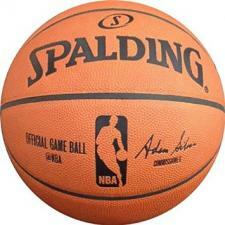 This ball has Adam Silver's name imprinted on it, who became the commissioner February 1, 2014. Made from the finest full grain leather for maximum performance and handling. Used by all NBA players. Great for Autographs. Call for quantity price breaks.